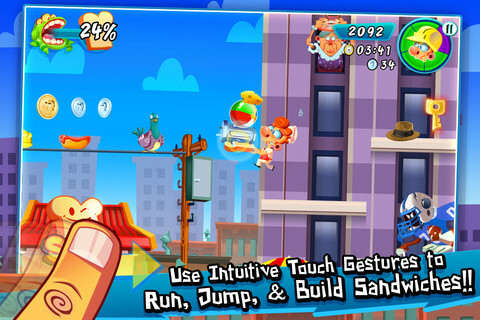 Bring Me Sandwiches is the newest iPhone app from Adult Swim games. The concept is cute – the player plays a sandwich maker who has to make bizarre sandwiches for an alien who has descended upon his shop. Bring Me Sandwiches! is available for iPad , iPhone, and iPod Touch and is an inexpensive little application that will keep either a player entertained for days. Bring Me Sandwiches! 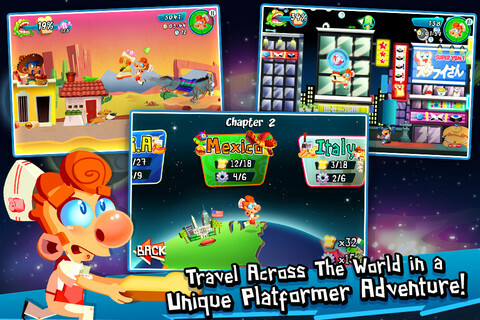 is a 2D side-scroller with colorful graphics and upbeat music. The player can decide whether they want to control the game with tilt (by tilting their iPhone or iPad ), touch (by resting their thumbs on either side of the screen as they hold it), or by touching buttons. The controls can be touchy for people not used to playing sidescrollers, but the only real penalty is missing time or a spilled sandwich. There aren’t enough dangerous obstacles to make this application as frustrating as other side-scrollers can be. My only real complaint is that there are goals to be met (such as a time, a specific score, and a number of spills you’re not to exceed) and the player doesn’t find out about these until after the level is done. It is necessary to get so many of these goals filled to add to your Spaceship graphic on the Food Journal. If these were shown before the level, it would be easier. Also, at times I would collect something that made my heart meter increase, but I could never find out what it was that I’d collected. The game is sometimes too chaotic to truly see what you’re doing. Overall, Bring Me Sandwiches! is a fun purchase and one I would recommend to anyone who likes side-scrollers. The levels are fast, at about two to three minutes a piece, and can be played over and over again. AppSafari review of Bring Me Sandwiches!! was written by Joe Seifi on October 26th, 2011 and categorized under Action, App Store, Arcade, Featured, Games, Platformer. Page viewed 3635 times, 1 so far today. Need help on using these apps? Please read the Help Page.